Even though I’ve been insanely busy with home life and running Etherkit, I felt like I needed to get out and do a bit of operating to get back in touch with that aspect of amateur radio. In the past few years, Dave W8NF has invited me to come up to the OTVARC Field Day site at Stub Stewart State Park, but I’ve avoided it due to the fact that late June is usually the time of year when my grass allergies peak here in western Oregon. Fortunately, this year has been a bit of a La Niña year, so it has been unusually wet and mild, which means that the pollen is under good control after a nice rain. A few days before Field Day this year, and my allergies had been pretty mild, so I decided to invite myself up to the public site to check it out and maybe do a little bit of operating. I arrived at the park at about 4 PM on Saturday. As you can see from the photo above, the weather probably wasn’t to the liking of most people, but it was perfect for me: dry, having just previously rained. 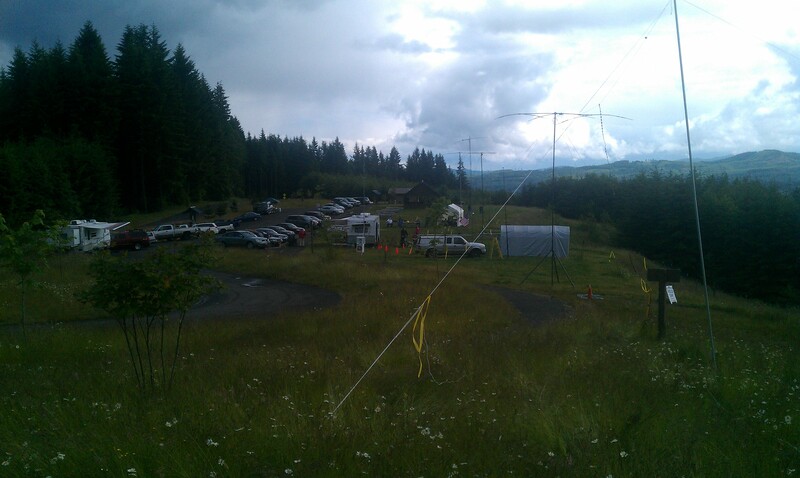 OTVARC had four operating positions set up: one CW/digital tent (two K3s), one phone tent (two IC-756IIIs), one VHF (where the above photo was taken), and the GOTA station in the RV you can see in the center of the photo. It’s hard to tell from the photo, but the antenna farm ran in a straight line from where I was standing down towards the pavilion in the background. There were 40 foot masts roughly equally spaced out with fixed beams on them, then wire antennas for the lower bands strung between the masts. After a bit of chatting with W8NF and some introductions to club officers and members, I partook in the grilled hamburgers which were offered (wasn’t going to eat OTVARCs food, but thanks for the invite!) and then Dave and I sat down in the phone tent to try to work some 20 meter SSB. I was at the logging PC and Dave was manning the mic (each phone station was equipped with Dave’s brilliant Logiklipper, natch). We didn’t have much success for some reason on 20 phone, probably due to the antenna we were stuck with (the G5RV, if I remember correctly). I ended up moving over to the other phone station, which was on 15 meters. I actually had a decent run of search & pounce operation, for a non-contester like myself. I wanted to try to park on a frequency and CQ, but I noticed it was 8 PM by this time, so I needed to get back home. Both before I left for Stub Stewart and after I returned, I also used Field Day as an opportunity to test out the “mainframe” of a new SSB transceiver design I’ve been working on (meaning the RF stages, minus the microcontroller/DDS/LED frequency display). 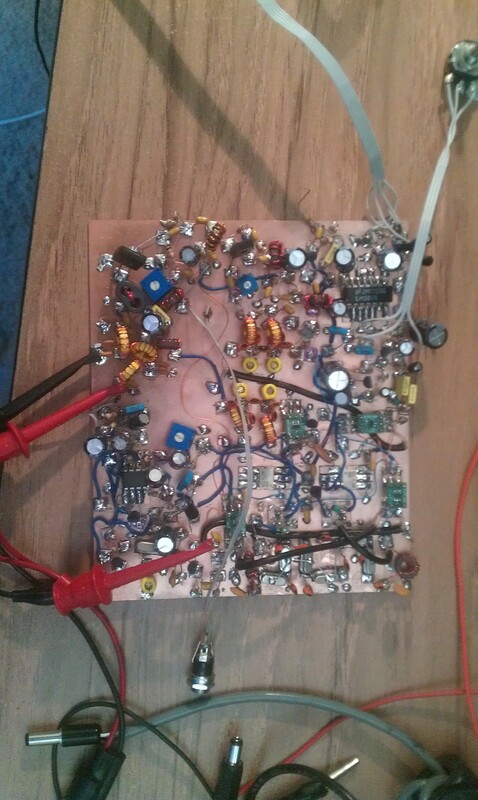 A breadboarded DDS-60 was used as the temporary VFO for the radio, and I connected the whole works up to battery power to work as 1E OR from my own station. This iteration of the radio is monoband (20 meters on this unit) and QRP (power output is about 7 watts max with a IRFIZ16G final), so I knew I would be a little guppy in a big pond, but figured it was worth a try just to see that it was working properly. I actually ended up doing better than I expected. In about 1.5 hours of casual search & pounce operation, I was able to make 11 QSOs with stations in the sections NE, ID, AK, PAC (x3! ), KS, AZ, and NM. The PAC stations were all in Hawaii and were booming in easily 20 to 60 dB over S9. Two of those three PAC QSOs were snagged on first call. It’s a little spooky having such an easy QSO only using 6-7 watts SSB over such a long distance. Yes, all of the heavy lifting credit goes to the other station, but QRP SSB can work if you take care to know your propagation and try to work the stations which are loudest. Given a QTH from a peak (such as a SOTA activation) and a decent antenna, I don’t doubt that it could be quite effective. So the rig seems to work, and I don’t even have a name for it yet, but it’s shaping up quite nicely. The microcontroller/DDS/LED module is nearly complete, then I’m going to package the rig in a WA4MNT-style copper clad chassis so that I can take the rig with me to Salmoncon in a few weeks. With any luck, beta testing will begin in no more than two months, and hopefully a quick entry to the market after that. On a side note, as much as it pained me to set aside the CC-Series to develop something else, I think it was vitally important for me to do so. I was too stuck in a rut with the CC-Series design and needed a mental breakout to something different. I’ve learned some good circuit design ideas from this radio, which should translate into vast improvements in the next iteration of the CC-Series. I do intend to give my CC-Series beta testers a worthy radio in this next round of testing.